Named ‘Prayer Procession to Protect Hindu Dharma’, the rally will start from Ernakulam Siva Temple on Saturday at 11 am. 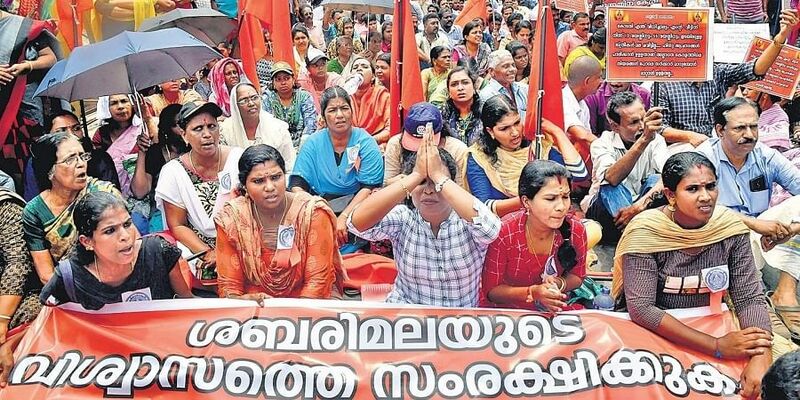 KOCHI: The city will witness a major protest march attended by nearly two lakh people on Saturday demanding the authorities to desist from ‘interfering’ with the rituals and traditions of the Sabarimala temple following the Supreme Court verdict permitting entry of women of all ages to the temple. Ayappa devotees along with political leaders and social activists will take part. Named ‘Prayer Procession to Protect Hindu Dharma’, the rally will start from Ernakulam Siva Temple on Saturday at 11 am. The procession will cover Park Avenue Road, Menaka Junction, High Court Junction, Banerjee Road, TD Road, Ernakulathappan Road, Club Road, and enter the Eastern Gate of Shiva Temple through DH ground. Former PSC chairman and Congress leader K S Radhakrishnan told a press meet here on Thursday the procession is not a political march. “It will be a peaceful march. The participants of the march will be carrying placards and banners. We demand the central and state government to file a review petition to adopt suitable steps to uphold the faith and belief of the Sabarimala temple,” said. Brahmashri Chennas Dineshan Namboothiripad will inaugurate the march. Panthalam Palace representative Sasikumar Varma will speak on the occasion. Suresh Gopi MP, VHP State president SJR Kumar, temple priests, social activists, cultural leaders, and Ayyappa devotees will take part. “This march is not against the Supreme Court. We have full respect for the apex court. However, our demand is to protect the rituals and traditions followed by Ayyappa devotees,” Radhakrishnan said. Asked whether women will be blocked from entering the temple, Radhakrishnan said doing so will be against the Supreme Court verdict. “The SC verdict is not the final step. There are provisions to file a review petition. So our demand to the government is to wait till a final decision on review petition before implementing the current verdict allowing women’s entry to Sabarimala,” he said. Other political and religious representative also spoke during the press conference.